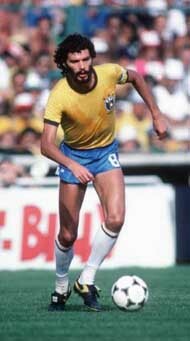 One of the most elegant midfield generals in soccer history, Socrates, began his career in Botafogo. He was never a teenage star and didn’t make his debut in the Brazilian national team until he was 25. He was blessed with wonderful skills, vision and seemed to have so many options when he was on the ball. He was able to play the ball wherever and whenever he wanted. His heel-kicks became famous world wide. These rare skills combined with the fact that he was a medical student more than justified him being nicknamed “the doctor”. 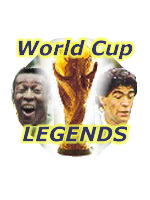 Socrates captained Brazil’s fantastic World Cup team of 1982 partnering Cerezo, Falcao and Zico in midfield. He scored twice in that tournament, one of them being a marvellous goal against the Soviet Union when he dribbled past two players before firing it home from long range. Brazil didn’t reach the semifinals in that tournament, but played some wonderful soccer. Socrates was not an ordinary athlete, infact he didn’t look at himself as an athlete. He smoked a pack of sigarettes every day, and that was one of the reasons to why he never settled in Italy when he arrived there in 1984 to play for Fiorentina. The lifestyle didn’t suit him and he went back to Brazil a year later. In 1986, Socrates again was instrumental for Brazil in their attempt of winning the World Cup, but France and Platini won on penalties in the quarterfinal after a wonderful match. Socrates missed one of the penalties in the shoot-out. He was the only player of the survivors of the 1982 team who really reached the same level, but it wasn’t enough to take them through. He scored more than a goal every third game in average for Brazil, which is excellent for a midfielder and added two more to his account in the Mexico World Cup. At clublevel he played most of his career for Botafogo and Corinthians for whom he won three Sao Paulo state championships. Socrates also played for Flamengo winning a Rio state championship before ending his career in 1990 playing for Santos.